Sam Anderson-Ramos discusses the art of observation with internal medicine residents. Keen observational skills are absolutely critical for physicians working to diagnose and treat patients. Without their doctors being able to accurately identify health issues — whether it’s noticing a patient is reluctant to talk about a sensitive issue that may hold important clues or finding a partially hidden questionable mole on a patient’s back — patients have little hope of being healed. Deficits in observational skills also often go hand-in-hand with physician burnout, says Dr. Anna Gramelspacher, who leads the narrative medicine program, funded by the University of Illinois College of Medicine’s department of medicine. 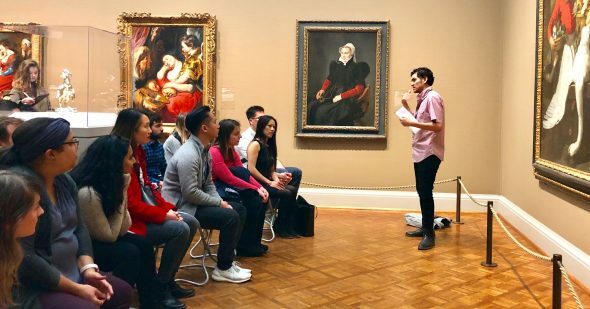 What better place to take physicians to improve their observational skills and combat burnout than Chicago’s Art Institute? Gramelspacher has partnered with Sam Anderson-Ramos, assistant director for college and professional learning at the Art Institute, to bring residents at the University of Illinois Hospital to the museum to look at paintings and other artwork to help them sharpen their eyes and give them an opportunity to relax, unwind and talk about the unique stressors at work with their colleagues. “There can be a lot of uncertainty in medicine, and looking at art and describing what is being seen can give them space for self-reflection and self-awareness,” Gramelspacher said. The residents were led through the galleries by Anderson-Ramos and participated in several exercises. In one, two residents stand back-to-back while one resident describes a painting she is looking at to her partner. “So often doctors dehumanize their patients — sometimes it’s necessary to be able to effectively treat someone who is sick or dying. Looking at pieces that remind them of a patient gives residents a chance to reconnect with the humanity of their patients,” Gramelspacher said. Getting out of the hospital where they can talk and share stories outside of their work environment can also help the residents relax, and hopefully ameliorate the all-too-common burnout many physicians face, Gramelspacher said. “In the museum, they can escape from the stresses of work and share stories among themselves, and the artworks serve as prompts for those conversations,” she said. The program with the Art Institute is just one of several programs Gramelspacher has launched in the department of medicine that marry the humanities to medicine. In her narrative medicine program, residents read, discuss and reflect on literature to help them gain skills in absorbing, interpreting and acting on the story of illness. Gramelspacher also has launched a mindfulness training for residents. “Mindfulness encourages self-awareness, wellness and resilience,” she said.